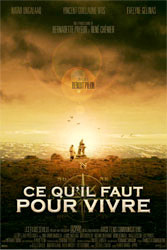 Ce qu’il faut pour vivre is based on the true events of the 1940s and 50s when Canadian Inuit were afflicted by a tuberculosis epidemic. For several years those in charge tried to find an appropriate strategy and finally decided to transport patients to sanatoriums in Montreal, Quebec City, Edmonton and other southern cities. The abrupt separation of loved ones only deepened the tragedy and the unexpected departures had tragic consequences. The movie tells the story of Tivii, an Inuit hunter, who is flown to a Québec City sanatorium to be treated. Uprooted, far from his loved ones and faced with a completely alien world, he finds himself unable to communicate with anyone. When his nurse, Carole, realizes that Tivii’s illness is not the most serious threat to his well-being, she arranges to have a young orphan, Kaki, transferred to the institution. The boy is also sick, but has experience of both worlds and speaks both languages. By sharing his culture with Kaki and opening it up to others, Tivii rediscovers his pride and energy. Ultimately he also rediscovers hope through a plan to adopt Kaki, bring him home and make him part of his family.